Ever since I was little I've struggled with dry skin issues. At seven I was diagnosed with eczema and ever since dry skin has plagued me. At times it's worse than others. I can have allergic outbreaks for unknown reasons that only steroids can remedy but it's for that reason that I only use soap that's specifically made for dry skin. When other people are using hard astringents to remove oil I'm adding moisturizers to keep it on. Recently I was asked to try Olay's Ultra Moisture Body Wash. Since I was headed to the beach last week I thought it would the perfect time to try it out since nothing dries out skin like the 3 Ss! Sun, sand and salt. 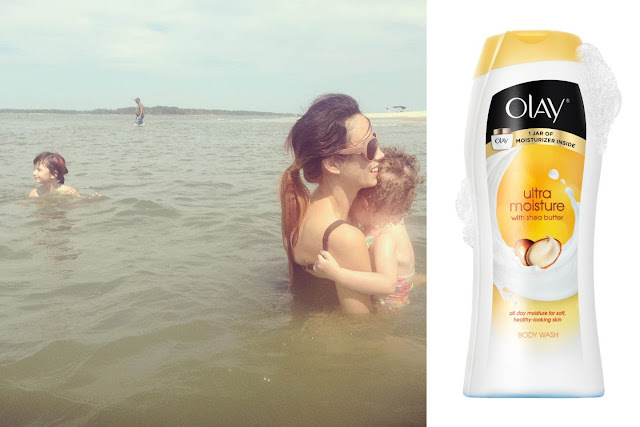 Everytime I got back from the beach I took a prompt bath and used Olay's Ultra Moisture Body Wash. Immediately I could tell the difference between regular soap. The texture was creamy like that of conditioner. And it had a different lather to it, not as sudsy, and left a smooth (sort of conditioned) feeling to your skin which I loved. It immediately got rid of that scuzzy beach feeling but still left my skin soft as if the beach never happened, not tight and dry like other soaps. If you look on the bottle it says "Over a jar of Olay moisturizers inside."